The weekend – that wonderful two-syllable word that sparks joy and relief in the hearts of people across the world. In theory it is our chance to put work on pause, rest, relax, and rejuvenate; but sometimes reality has a different vision. It is too easy for schedules to become filled with competitions, sports, birthday parties, and other commitments. Before you know it, the weekend passed by too quickly, leaving you wishing you had gotten more accomplished. Then, as Monday rolls around, you cannot help but wonder what was so restful, where the time went, and how it could have been better spent. Bringing a sense of family back into the weekend might mean stepping out of the normal flow of commitments and to-do lists, so that, with a little thought and planning, those treasured days can be brought back and used to strengthen your family unit and find that rest you have been needing. 1. Check the Calendar – It would be wonderful to have every weekend schedule free to do as you wish, but with multiple people, activities and interests involved, the calendar can fill up fast. Keep close tabs on the status of your family calendar and be sure to reserve some family time, as well as time for everyone to slow down. Find those rare weekends that don’t have back-to-back commitments and plan to turn them into meaningful time as a family. Without planning ahead, it will be here before you know it; while you are scrambling to find fun activities to do together as a family, the rest of them may find their way to the TV, iPad, and computer screens, making it hard to recover their attention. 2. Prioritize – Your child may have commitments to a sports team or a program that meets weekly on Saturday mornings. While it is important to honor these commitments as an important lesson on dependability, it is also ok to categorize other social events like birthday parties, grilling out with the neighbors, etc. as optional. Give yourself permission to say no in order to have the time needed for your family to spend together. Prioritize the activities and decide what is most important in general for everyone’s health and happiness. 3. 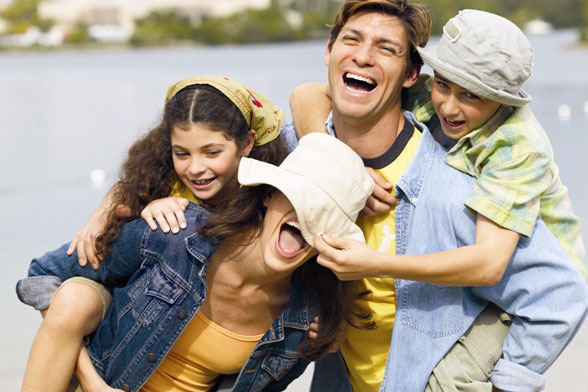 Plan Family Time – Becoming a strong family unit often requires actually spending time together. Spend time together cooking a themed dinner, have a family game night, or see our list of Memory Makers and Boredom Busters (p. 84-86) for more ideas. Doing a family scrapbooking project where everyone has a task they are responsible for helps everyone establish a role in the family as well as benefit from the act of learning new skills or lessons together. Another great idea is to create a tradition unique to your family. Knowing that they will wake up Sunday morning to the smell of Dad’s famous waffles makes for a pleasant memory that will stick with your children throughout their life. 4. Allow for Down Time – Do not forget that rest and relaxation is an important part of the weekend. After a full week of school and work, it is ok to allow your family time to relish in a long afternoon nap or veg out watching a movie. Give yourself time to recharge. 5. Prepare for the Week – There are lunches to be packed, dinners to be planned, and as always, laundry to be done. These tasks can be done with the help of the whole family. Declare all hands on deck and delegate responsibilities. Set the kids up with an assembly line to pack their lunches, assign Dad to getting the laundry flowing through the washer and dryer, get to work whipping up a casserole and a few side dishes to get you through at least a few nights of dinner, then wind down with everyone helping fold the clean clothes. Make it a challenge to see who can finish first to add a little fun. Kids will enjoy being a part of the activities that help your household run, and when everyone gets involved, the overall time to complete the necessary chores can be cut in half. It may feel like the mythical “weekend” has slipped out of your hands and is gone forever, but it is time to reclaim your right to relaxation and family fun! Start planning today for the next time you are blessed with a few free days to live it up as a family.